Yes, Thanksgiving was barely a memory and people were speeding down my street with trees strapped to the top of their car. Pumpkins getting dumped in the trash. Leftover turkey thrown into a pot of chili. I am just happy we have a grand total of 32 days between Thanksgiving and Christmas this year! I am not the organized Christmas person with gifts purchased and wrapped in August. I tend to meander through holidays, sipping the last vestige of a Pumpkin Spice Latte while it is being erased from the drink board. I usually do a last minute Target run for the Thanksgiving turkey pan or some other thing I have forgotten. This is when the Christmas stuff is newly on the shelves…. I am seduced by the lack of crowds and fresh, clean holiday swag all around me. Hence, my third year doing a Target Christmas post. I find ADORABLE stuff there every year, like this $4.00 reindeer mug and $4.00 reindeer ornament. $5.99 wine stoppers. Tie these to holiday napkins for a cute hostess gift. Love this $17.99 Christmas Tree table runner and matching plaid napkins ($9.99 for four). My holiday table this year is set! Little holiday bags for $1.00. A tweed stocking for an unexpected guest. Festive pom poms and a leather handle $13.00. $20.00 Target Holiday Truck decor! A $5.00 mini ornament version of the Target truck and $1.99 drink tumblers. Bring this $5.00 Santa flask to your next paddle game or ice-skating at Wollman rink! It’s hard for me to pass up a Nutcracker…. I have admittedly overdone it with these, so my daughter got this $10.00 Nutcracker for her new apartment, but I kept the two $9.00 fuzzy white trees. Here is my little wine stopper with $3.00 holly jolly cocktail napkins! Then there are the ornaments… I find so many cute ornaments at Target every year. There is a little hunting involved, but it is well worth it. 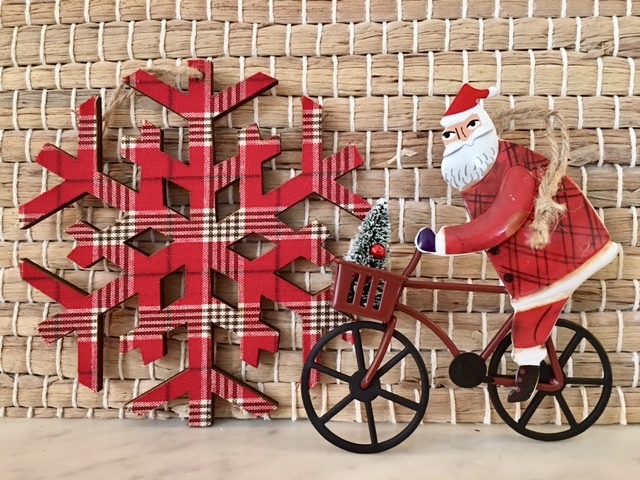 Plaid snowflake $3.00, plaid Santa on a bike $6.00. 2017 Holiday door ornament $5.00, Christmas barn ornament $5.00. VERY cute stuff. There is no relationship between The Wry Home and Target (unfortunately). They wouldn’t know me if they fell over me! Here is my own holiday contribution – two festive candles! My older Target Christmas posts to browse if you are so inclined: December 2014 and December 2016. So glad I found it and could send to you!